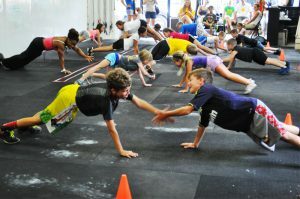 OSWEGO, NY – The Oswego YMCA will offer a youth Total Performance Training program starting July 18. The Oswego YMCA will offer a youth Total Performance Training session for five weeks starting July 18. Training groups will meet Monday, Wednesday and Friday at two varied times. Group I for ages 12-17 will meet 2 – 3 p.m., and Group II ages 8-11 will meet from 3 – 4 p.m.
Pre-registration is required at the Oswego YMCA. The YMCA Total Performance Training sessions are designed to produce improvements in athletic performance, with a focus on speed, agility and power. Programs are designed for youth, middle school and high school athletes, as well as team members and will be led by Y strength and conditioning trainer Shane Bartrum, Ithaca College ‘15 Division III Wrestling All State and All Conference member, and OHS alumni football and wrestling outstanding senior athlete with more than100 career wrestling wins. Training in small groups will ensure maximum one-on-one attention. Sessions will focus on athletic fundamentals while progressing and maintaining athletic movement for specific sports demands. Refining and rehearsing fundamental skills of speed, agility, and power with added strength training, will lead to permanent and positive athletic change. “The benefits of a repetitive strength, agility and endurance training program provides numerous benefits to the young athlete,” said Bartrum. Bartrum noted that proper movement techniques with increased force production can lead to maximized potential. He noted that as athletes naturally increase in height, weight, strength and aggressiveness, the need for improved joint integrity is vital in order to reduce the chance of injury. All this, Bartrum said, will result in positive athletic improvements. Special pricing is available and registration for the Youth Total Performance Training can be completed at the Oswego YMCA. The YMCA is located at 265 W. First St.